I couldn’t read a book or even flip through a magazine because the words floated in front of my eyes and made me nauseous. Watching TV had pretty much the same effect. Two different drugs were flowing through my veins; one slowly dripped into my arm from an IV bag, the nurse plunged the other into my veins with a large syringe. All the cells that were fast growing would die; my hair fell off of my head first and after the first couple of chemotherapy sessions, there was no hair left anywhere on my body. 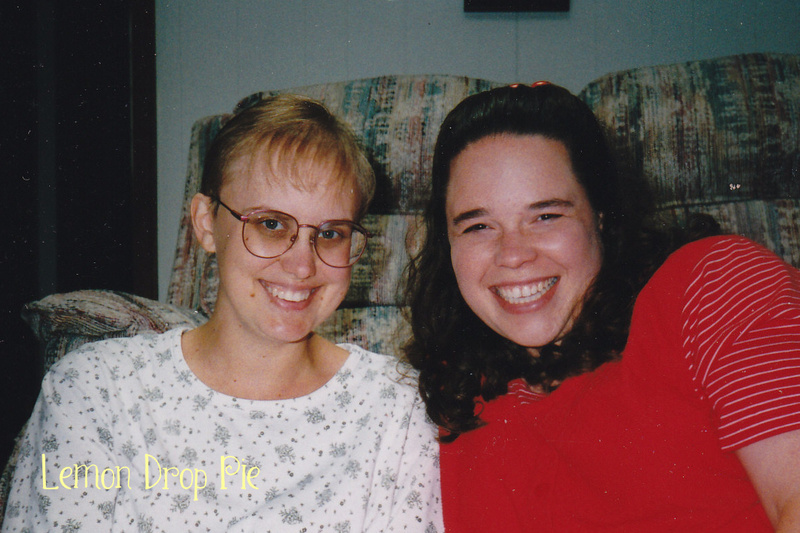 The hope was that the chemo would kill the cancer cells and keep me alive. During those months of treatment, I was always so tired. I lost my appetite because food tasted funny. I dreamed of hair brushing my cheeks again some day. Late at night, I would often wonder if I would ever get my old life back again. Eventually, I did. The chemo killed the cancer. My hair grew back. I had to shave my legs again…yes, I had gotten my life back! A few years later, the needle was inserted into my back instead of my arm. The drug did its job and I couldn’t feel anything from the waist down. It was so strange to feel the doctor tugging at my midsection and yet have no sensation. I couldn’t move my legs; they felt dead. Lily let out a holler as she was born via Cesarian, and suddenly my numb legs were forgotten as I strained to catch a glimpse of my newly born daughter. The bottom half of my body seemed to be dead even as a life was being born. What a joy my first daughter was to us! Life seemed even more precious to Ed and I than it ever had before! 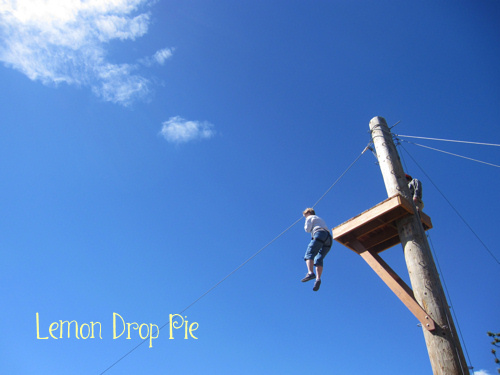 It is hard, much harder than I thought it would be, to jump off a telephone pole into the air. Sure, that sounds like you’ll die if you jump, but you’re really wrapped up in a harness that’s hooked up to a thick steel line. You’ve checked the connections a million times. Your buddy has also checked your harness thoroughly. But your heart is thumping in your chest as though you are about to take a deadly plunge into the abyss. I held onto the rope for dear life as I stepped off the platform. The rope caught me as I fell and the wind hit me in the face. I felt like I was flying. I was truly alive. Time to share your Spin! Gretchen at Second Blooming and I are teaming up to bring you the Spin Cycle. Link up your blog post below, or share in the comments: tell us your take on “Everything that kills me makes me feel alive!” Join us again on Monday to find out what next week’s prompt will be. As soon as you started talking about chemo, I thought about my mom’s cancer and how she said, “They are putting medicine in me that is killing me, in order to keep me alive.” Such a crazy thing to wrap your mind around. I love the angles you took on this one! It is a very crazy thing! I learned too much about how crazy when I had to go through it, as I’m sure your mom did, too. I had to laugh at your excitement about being able to shave your legs again. Who would’ve thought a woman could be grateful for that? Oh, yes, definitely keep ziplining on your bucket list! It was so much fun! I would definitely go again if I had the opportunity. Such contradictions. Medicine that kills as it heals. Another medicine that takes away physical feeling just as you are experiencing utter joy. And jumping off a ledge when “common sense” tells you not to. You wrote about it all wonderfully! You are such a twin of my cousin, Wendy. In all of your pictures! She, too, radiates beauty and life. This was such a beautiful post – you have such a way with words when you describe what your body and heart has been through. More than most. Thank you, Tamara! Those are such wonderful compliments! That first photo still has your amazing smile. If there is one feature of yours that always shines though, is your smile. Wow, to be so sick yet to look so happy. That is amazing. Where did you go ziplining? We were on vacation in Colorado about 3 years ago. It was such a great experience! Okay, this just made me do a quick self-check on my breasts. That must be a completely weird feeling, knowing that the chemo is killing your body’s cells. And yet making you well. It’s so scary. And your wellness is such an inspiration. And the zipline? EEEK!